You’d think, after so many years of gardening and a love of fruits being such a important part of said gardening, that by now I would have planted every fruit I might ever have wanted to plant. Not so! Hard to imagine, but even here in the 21st century, new fruits are still coming down the pike. I don’t mean apples with grape flavor (marketed as grapples), a mango nectarine (actually, just a nectarine that looks vaguely like a mango), or strawmato (actually a strawberry-shaped tomato). 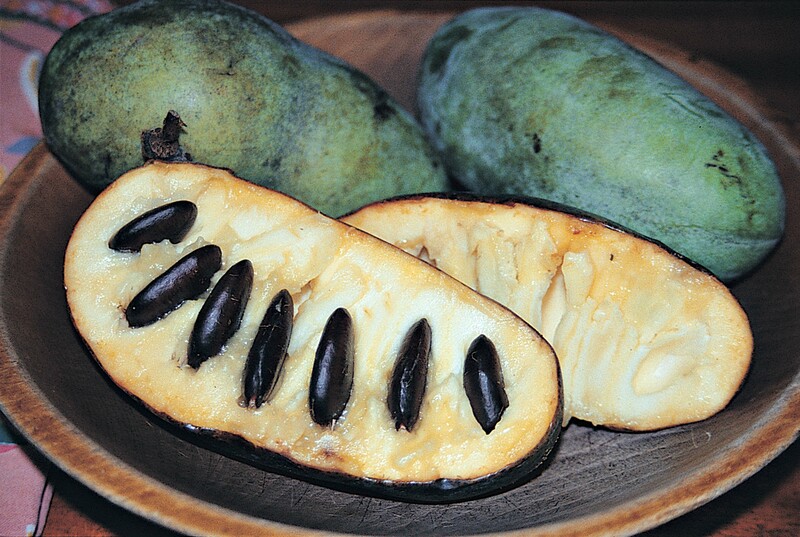 There are plenty of truly new fruits, in the sense of kinds of fruits hardly known to most people, even fruit mavens. Over the years, I’ve tried a number of them. Aronia is a beautiful fruit that makes a beautiful juice, so it’s getting more press these days. I grew it and thought it tasted awful. Goji’s another one in the public’s eye for it’s many health benefits and ease of growing; it also tasted terrible and I also escorted that plant to the compost pile. Some lesser known kin of raspberry had greater potential. I planted arctic raspberry, which grows as a groundcover and has been used in breeding for the good flavor it imparts to its offspring. The plant never bore for me. Salmonberry and thimbleberry similarly had gustatory potential but never bore well in my garden. I’ll give these plants another try someday. I’m tentative about honeyberries, which are blue-fruited, edible species of honeysuckle that bear young, fruit early in the season, and weather cold to minus 40 degrees F.. The “blueberry-like fruit” is so only in being blue. I planted a couple of bushes about 20 years ago and was not impressed with their yield or flavor — but I admit to neglecting the plants. More importantly, a lot of breeding has been done to improve the plants since I put my bushes in the ground. Stay tuned for my tastebuds’ report on the flavor of recently planted Blue Mist, Blue Moon, and Blue Sea honeyberries. Reading what I just wrote might give the impression that planting any fruit except apples, peaches, and cherries — the usual, that is — leads to either failure or tentative flavor. Again, not so! Uncommon fruits adaptable over large swathes of the country that are easy to grow and have excellent flavor include pawpaw, American persimmon, gooseberry, black currant, hardy kiwifruit, Nanking cherry, and alpine strawberry — all documented in detail in my book Uncommon Fruits for Every Garden. All these plants grow and bear with little or no intervention on my part (and are available from such nurseries as www.onegreenworld.com and www.raintreenursery.com). 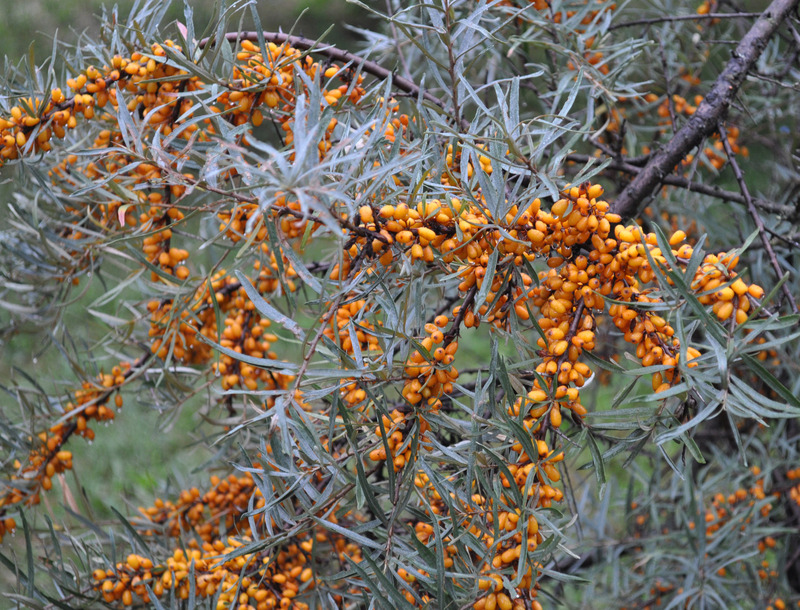 Seaberry (Hippophae rhamnoides) didn’t make it into the book, which includes only “dessert fruits,” that is, those you can enjoy by just popping them into your mouth. But I’m happy I gave these bushes some of my real estate. Juiced, diluted, and sweetened, the delectable flavor is akin to rich orange juice mixed with pineapple. What’s more, the bushes are decorative and tolerate neglect, cold, drought, and deer. Blackcaps have perennial roots but their stems are typically biennial, growing only leaves their first year, fruiting in midsummer of their second year, then dying. Two new blackcap varieties, Niwot (www.noursefarms.com) and Ohio’s Treasure (www.hartmannsplantcompany.com), do this one better: They start to bear on new canes towards the end of the first season, then bear again on those same canes, now one-year-old, in midsummer of the following year. You reap two crops per year, one in midsummer and one in late summer going on into fall. Or, for easier care but only one crop per year, the whole planting is mowed to the ground each year for a late summer-fall harvest. 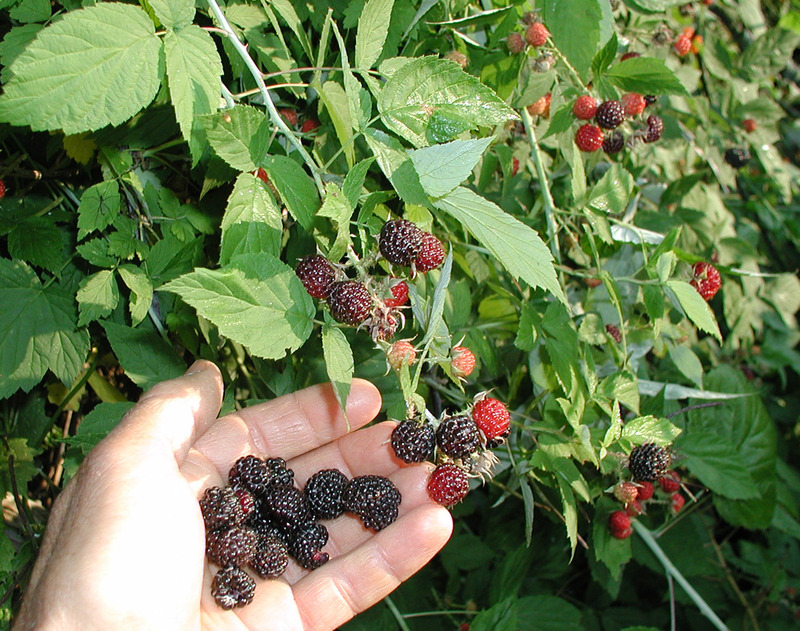 These two-crop blackcaps, just like two-crop (sometimes called everbearing) red and yellow raspberries, have the added advantage of bearing their first crop the same year that they are planted. My plan is to plant in mid-April, even though right now more than a foot of snow still blankets the ground. Snow or no snow, I’m sowing vegetable seeds, the second wave of the season. (My seed sources are www.fedcoseeds.com, www.sustainableseedco.com, www.johnnyseeds.com, and www.reneesgarden.com.) Today, the lineup includes the new varieties (for me) Tuscan Baby Leaf kale, Tiburon Ancho hot pepper, and Round of Hungary and Odessa Market sweet peppers. With encores for their good past performance are Gustas Brussels sprouts, Early Jersey Wakefield cabbage, Winterbor kale, and Carmen Sweet, Sweet Italia, and Italian Peperocini sweet peppers. This entry was posted in Fruit, Gardening, Vegetables and tagged alpine strawberry, black currant, blackcap, gooseberry, hardy kiwifruit, Nanking cherry, pawpaw, persimmon, seaberry. Bookmark the permalink. Trackbacks are closed, but you can post a comment. I too grow the seaberry but haven’t yet found the right ratio to turn the brilliant colored fruit into a desirable juice. Can you share your recipe? See http://www.leereich.com/2011/01/garden-is-winding-down-so-ill-look-into.html for more details about m seaberry concoction. It is exciting to read about your gardening plans this year! I am anxious to see which of my fruit trees/bushes have survived our low of -27F this winter in zone 5b. This year the only major addition to our landscape will be 175x asparagus plants from nourse and everbearing strawberries destined for containers. We’ll see how it goes! How long did it take until your seaberries started producing any useful quantity of fruit? I’ve planted 2 males and 4 females – the males are big and vigorous, but the females are extreeeemely slow growing and have yielded just a handful of fruit in 4 years. I think that they bore within 2 or 3 years. One male can pollinate up to about 8 females. Early Jersey Wakefield has been my old stand-by for years. And it was my grandmother’s as well. I let wild blackberries grow at the edge of my Potager – I tie them up a bamboo cane for better (safer) picking – small but incredibly sweet. I have always been intrigued by honey berry. I may give it a go someday. I am not much of a fruit eater – veggies are more to my taste – good thing they are easier to grow! Tuscan kale is my favorite and I grow it every year.